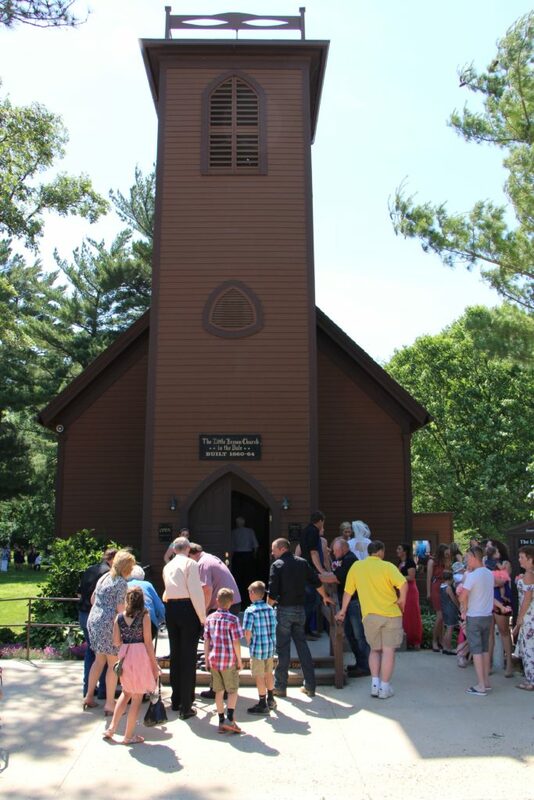 Our family attended a wedding at The Little Brown Church in the Vale located just east of Nashua, Iowa. 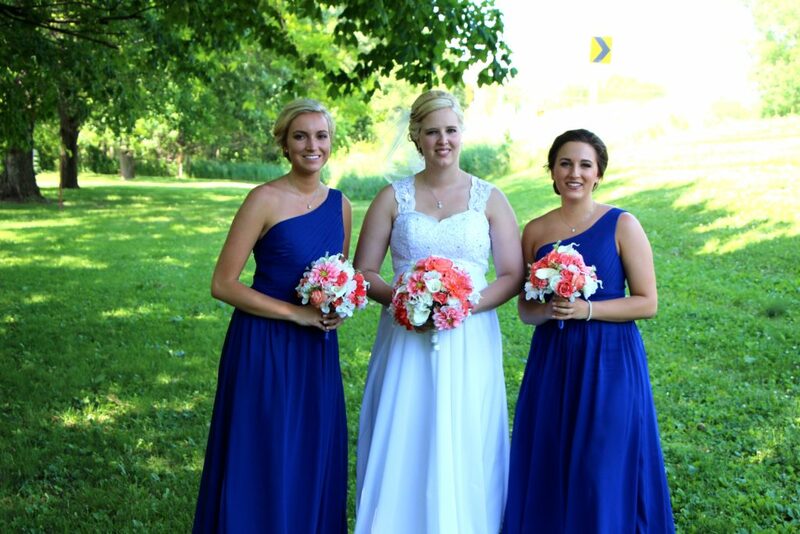 Our daughter, Noelle was a bridesmaid for the wedding, Amanda, the bride is a dear friend and a high school classmate. Almost everyone around here is familiar with this church, but for those of you who are not please check out the link. 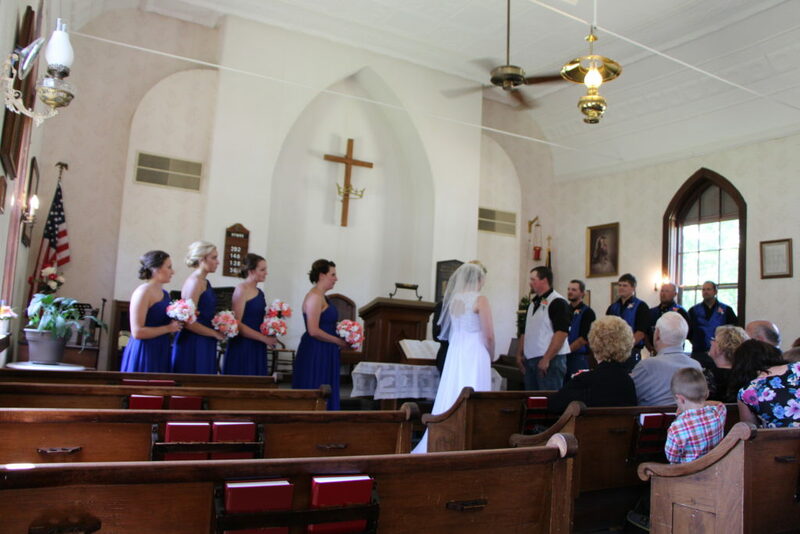 It is a very small church and people from all over come to be married there and renew their wedding vows, it is a simple intimate setting to celebrate with your closest friends and family. The Monday before the wedding one of the other bridesmaids contacted me about her dress. She had just picked it up, and the alteration place had hemmed her dress and it was not to be hemmed at all. I told her to come over and I would see if I could help her. She and her mother arrived and she put the dress on, it was 2 inches too short in the front and 3 inches too short in the back. 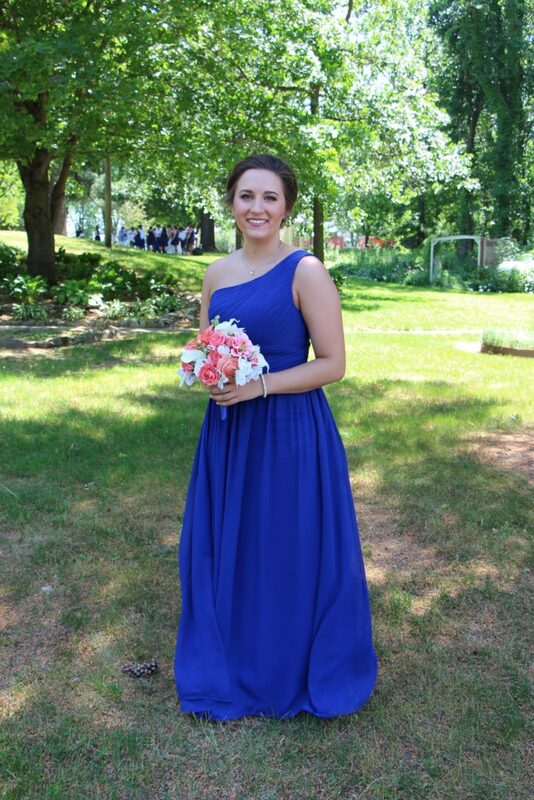 Her mother and I worked together to take out the 1/2 inch hem, yikes, how is a person suppose to lengthen this dress! 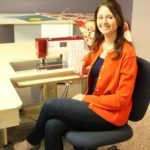 The fabric that was cut off was not sent with them either. As you can see in the photo I do not have much to work with. 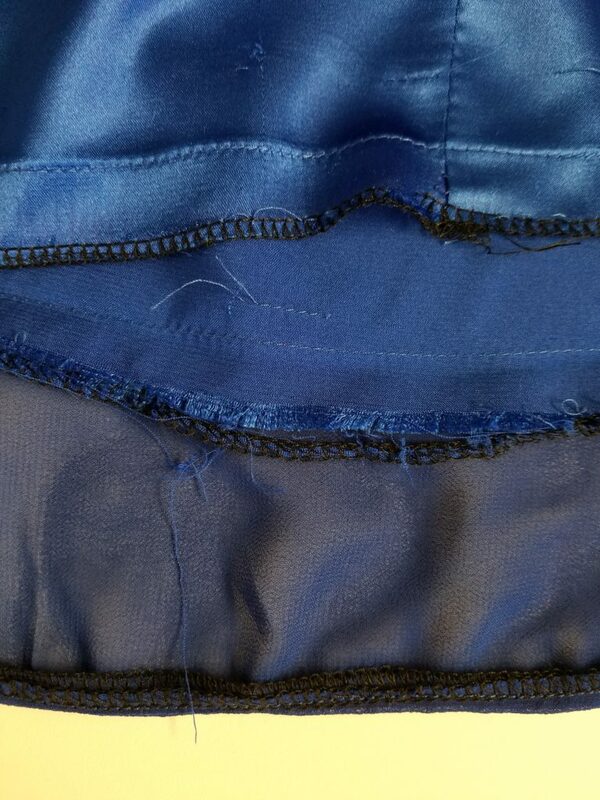 The fabric is fraying terribly and who uses black thread on a blue dress? 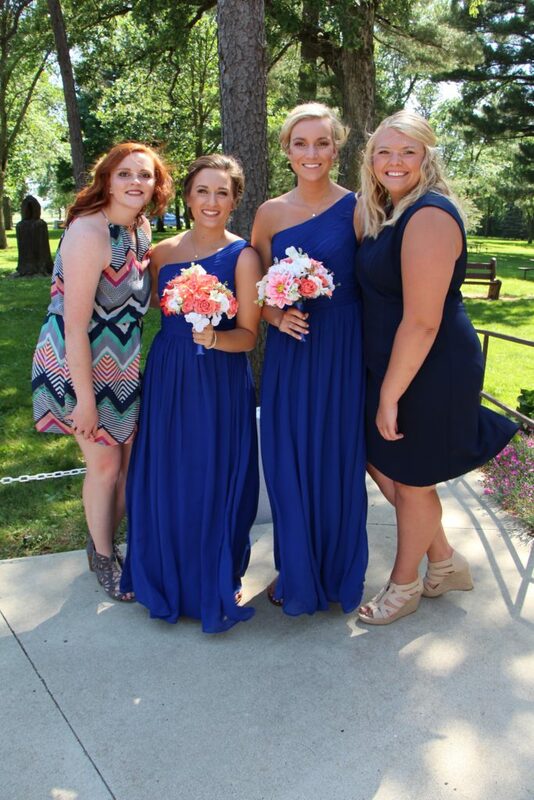 The mother knew that Noelle was also a bridesmaid and wondered if we could use any of her dress. I told them that I would do my best to lengthen her dress and that the bridesmaid should paint her toenails extra pretty for Saturday because they will be for sure showing! The first thing I did was to add Noelle’s extra satin fabric layer that I had cut off, to the back of this gown. The dresses had a corset back with very long ties. 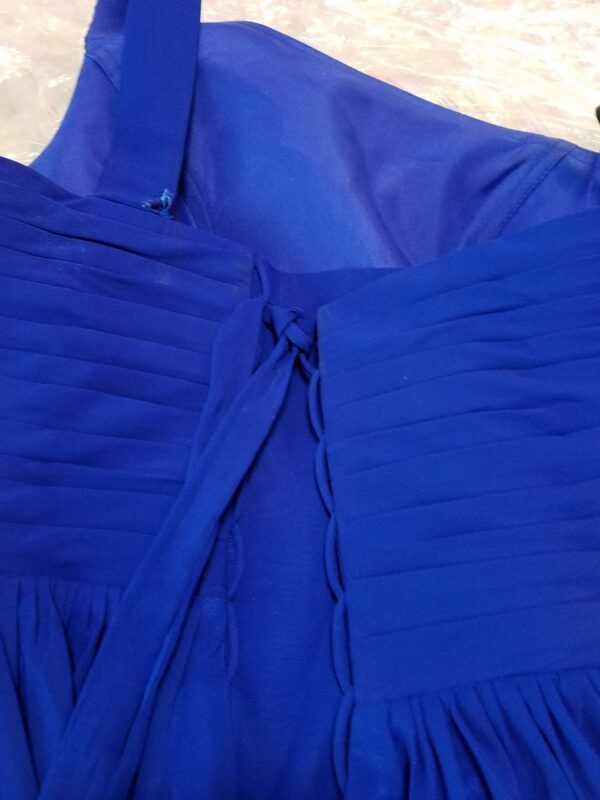 I took off as much as I could from both dresses and added that as well to entire dress hem. The last step I did was to add the extra sheer over lay fabric from Noelle’s dress only to the back of this dress. The seam was noticeable, so much so, I felt it would be distracting if I did it in the front. 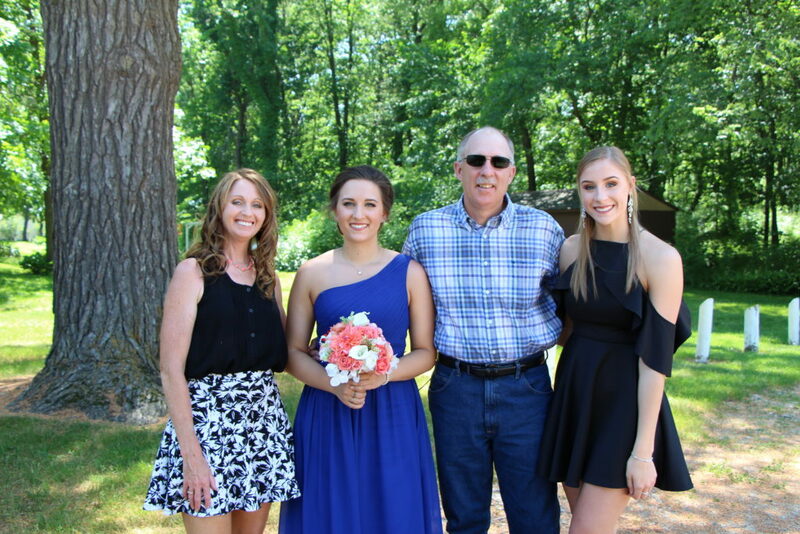 When they came to pick op the dress on Friday, we all decided it was better than when they brought it and she would look beautiful for the wedding. 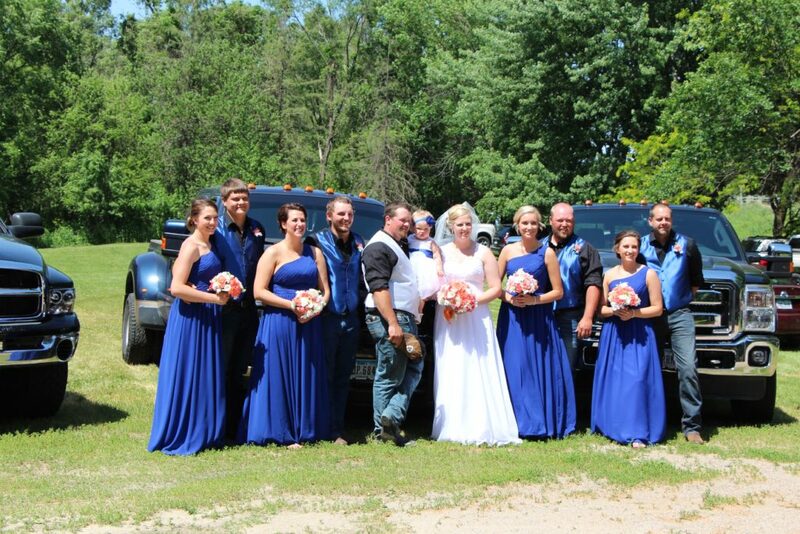 Here is a photo of the wedding party, from a distance you cannot tell who is wearing the dress that is to short! This entry was posted in Uncategorized on July 27, 2017 by Carla. I was wondering how you were going to tackle this. It turned out great.